Traditional Italian comfort food is one of those soul warming pleasures in life that once experienced, is hard to forget. With centuries of cultural culinary rituals, these delights are celebrated around the world. On a cool fall night, we ventured out to explore the timeless treasures from the Northern and Central regions of Italy, on the Upper East Side of Manhattan. Paola’s Restaurant, located at 1295 Madison Avenue, in the heart of Carnegie Hill, was pulsing with a positive energy from the moment we arrived. With every chair filled and an ambiance that welcomes, the surroundings were vibrant, while being extremely cozy. Like a family gathering, everybody seemed genuinely happy to be present, making it immediately apparent that this place is indeed something special. From the soft shades of orange enveloping the walls, to the beautiful wooden bar, to the tiled floors, this environment is infused with warmth, caring and taste. Paola’s has a nomadic history–with twenty-six years of pleasing the demanding palette of New Yorkers, their current home is their third location. Enhancing this vibrant neighborhood since February 2009, they have developed a fierce loyaltfrom the friendly locals. The problems of the world are checked at the front door and you are welcomed into Paola’s “home”, by Paola Bottero herself–an animated, warm and inspiring entrepreneur. She is the embodiment of kindness and professionalism, and manages her domain with a grace that only a lifetime of experience can bring. We started off the evening at the bar with a Peach Martini. Sounds simple, but add blended fresh peach puree to the mix and your taste buds are jolted to life. With heavenly aromas swirling about and warmed up with a rosy hue from the tasty cocktail, we were ready to feast. Upon being seated, we were enthusiastic about getting started and began our titillating tour with the aptly named Mozzarella (house made warm mozzarella with tomatoes, fresh basil and a taggiasca olive vinaigrette), but a typical preparation of mozzarella this is not. You may have noticed that it is described as being served warm. This does not mean that they pop it in the micro for a few seconds–what this means my friends, is that they make it from scratch, to order! This is as fresh as mozzarella gets and indicative of the care that goes into every dish making its way out of the busy kitchen. Off to an inspired start we proceeded to explore the appetizer menu in more detail. The Polpettine Alla Romana (little meatballs in savory tomato sauce with pecorino and ricotta) and the Calamari In Padella (seared squid topped with aromatic breadcrumbs, extra virgin olive oil and a squeeze of lemon, served in a cast iron pan) firmly put the “C” in comfort food. 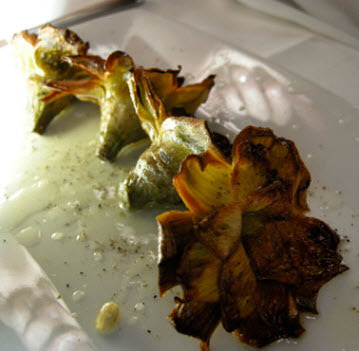 Add to that the ever popular and visually appealing Carciofi Alla Giudea (a Roman-style preparation of crispy fried artichokes), which seems to be a favorite among the regulars, and the appetizer portion of the meal was complete. The pasta section of the dinner was launched with the sumptuous Agnolotti (veal and spinach filled pasta tossed with butter, veal reduction and shaved black truffles). Draped across the top of this house-made pasta was a thin sheet of parmesan, that being warm, delivered a sensation that waltzed on the palate with the essence of the black truffles. It took all of my childhood training in manners, to not pick up my plate and lick it clean–it was simply that good. Next came the Pappardelle con Ragu di Vitello (flat ribbon noodles with veal ragu), a classic preparation. There is no nouvelle cuisine to be found here, everything is traditional and cooked to perfection just the way it has been done for hundreds of years on the other side of the pond. The special menu item of Artichoke Ravioli with a Lamb Ragu prepared in the Abruzzi style was another foray into traditional comfort food. This dish had me envisaging a family dinner table in the mountains of Northern Italy and beckoned for the addition of a glass of Malbec, which was readily available by the glass from Paola’s diverse wine menu and happily delivered. The secondi portion of the evening got started in a grand nature with Anatra (seared duck breast with whole grain red Italian mushroom risotto, house made apricot mustard and black truffle vinaigrette). This masterpiece was traditional, straight forward and absolutely cooked to perfection. We were sighing with satisfaction when the Seared Scallops with Leeks were placed before us. The feathery lightness of this dish gave us just enough breathing room to indulge in the final offering which arrived in the form of New Zealand Venison (a rare sight in this neck of the woods), with a red wine reduction, served alongside a heavenly soft polenta blended with kabocha squash. After a decaf espresso and a slice of a sublime Lemon Tart which was served with an unsweetened whipped cream to delicately balance the sugary goodness, we were ready for a warm blanket. Paola’s Restaurant was a discovery that will be re-visited enthusiastically. If I have any say in the matter, one of the city’s best-kept secrets will have their cover blown.